Sunshine Through the Rain: It's nearly Christmas! 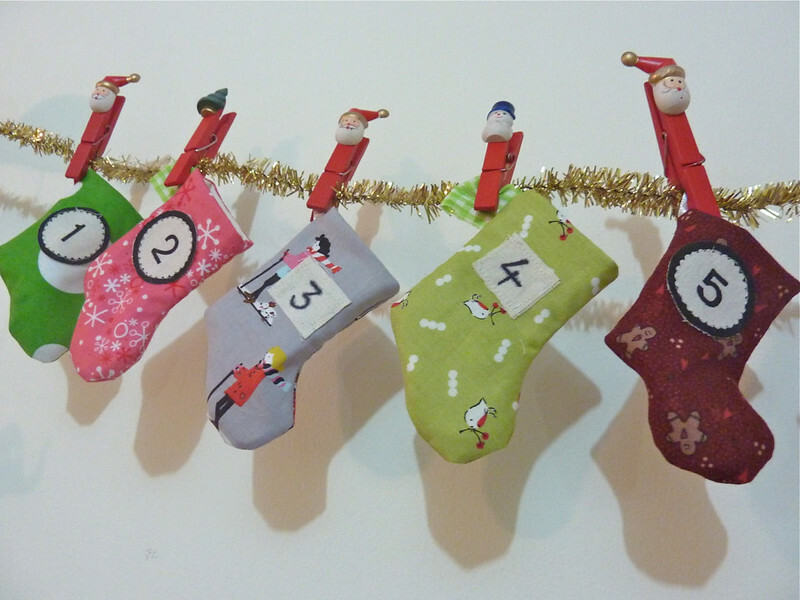 I decided last week that it was time for me to make an advent calendar that would last! Over the years I have made advent calendars from envelopes, toilet rolls, muffin trays, cardboard boxes.. and those are just the ones I remember! This year I wanted one that would mean there would be no more panic at the start of advent in the years to come! I also wanted it to be small and light as some years we don't have Christmas at home. I found this great tutorial by Trillium Design and thought it would work really well because when we are travelling we can just take the stockings for the days we are away. 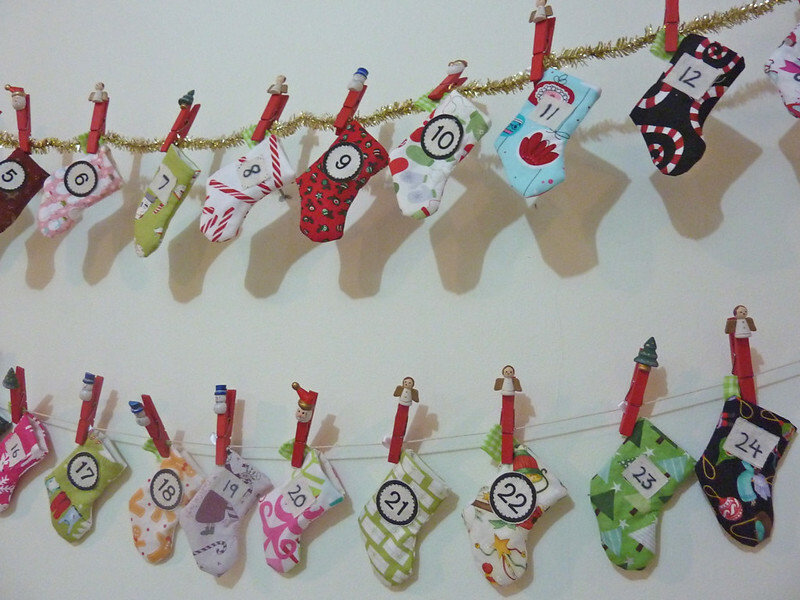 I used fabric from a Christmas fabric swap that I was involved in earlier in the year, and the numbers came from a scrap pack from Maze and Vale (I realised too late that I didn't have all the numbers so I had to make some of them myself with a Sharpie pen!). I have had the pegs and tinsel wire for a while. It is supposed to be for hanging up Christmas cards. However we seem to get less and less of these as the years go by so I decided to use it to hang up the stockings instead. Each stocking contains a Bible reading, an activity (this year chosen by my boys so they include things like a family nerf gun fight!) and of course some precious sweets or chocolates from home. We all look forward to reaching the end of dinner and enjoying this precious family time, remembering the true meaning of Christmas. Hi! This is Super cute and fun! These are very sweet - now I'm wondering if it is too late to make some! Love these tiny stockings and those clothespins a too cute! Tiny stockings are gorgeous and the pegs! Love your ideas for filling them. Very cute and will last for ages. That's really a neat advent calendar, Deborah. Those little stockings are adorable and I love the one with the scooterers on it. So pretty Deborah. The little stockings are super cute. That is really cute. Shop bought Advent calendars can be really tacky sometimes and I love the idea of a family activity. So cute and a perfect calendar for you! I love how you include a verse each day as well as an activity or sweet. I am going to do that as well! Thanks for sharing your great ideas!! What a great advent calendar Deborah! I love the fact that you can transport the days you need if you are travelling. Adorable! What a fun idea! 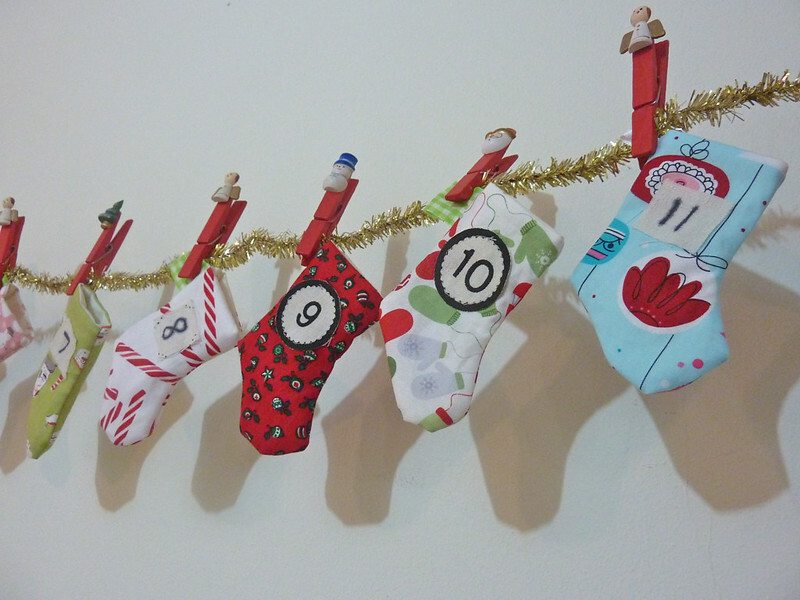 I can see you have done quite a lot of careful work there, sewing and turning tiny little stockings! Cute! A very cute and practical way to celebrate advent! I love that you can take the relevant days away with you during travel. Awesome, love this idea will have to do it next year! A year (plus a bit) in the making!